If you look at a textile designed by Mengly Hernandez, you will see a dynamic emotional landscape rendered in color, line, and shape. Yet there is something inwardly calming about looking at her compositions, even when they express electricity and tension. Perhaps it’s because the designer herself is a force of quiet confidence, who has been channeling chaos into creative energy for years as a mother, stylist & entrepreneur. As a textile artist and designer, Mengly’s work for her textile brand Linea Germania is instinctive, refined and free-flowing. 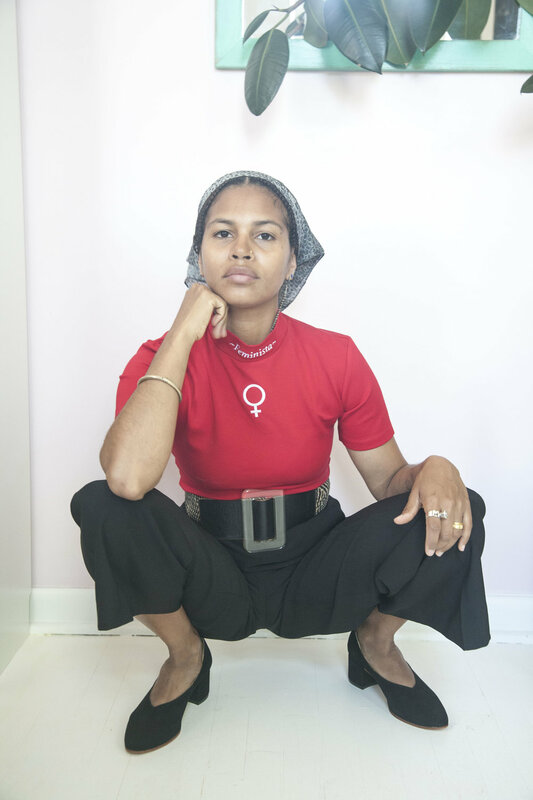 Born and raised in Washington Heights, NYC where she still lives with her husband and two children, Mengly is passionate about global travel and remains deeply influenced by her Dominican heritage. We visited her at home right before her first design development trip to Nepal to discuss career evolution, representation, and her creative process. 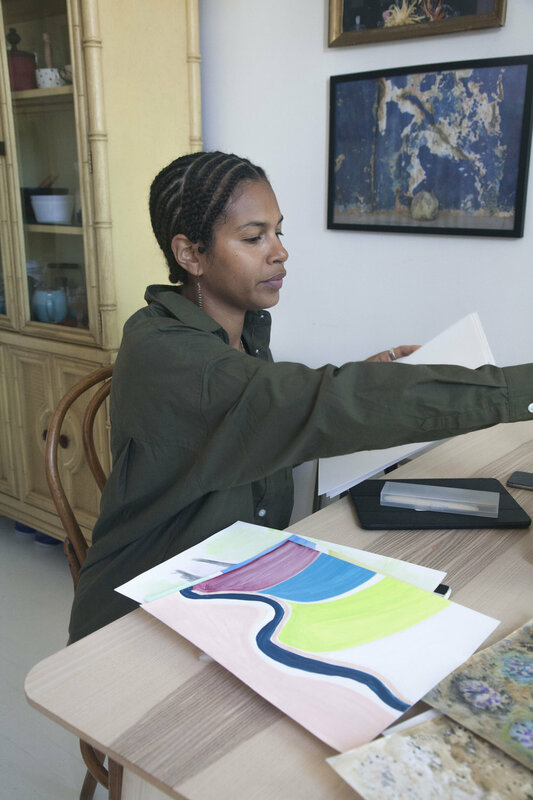 You went from working behind-the-scenes in an NYC fashion company to becoming a stylist to becoming a textile artist, designer, and entrepreneur. Where and how did you learn these very different skill sets? Did you have formal training in any of these professions, or are you self-taught? Which of these do you consider to be your true vocation? I am self-taught, as I received my bachelors in marketing and business management. I didn’t go to art school, but I've always had a huge curiosity that propelled me forward to seek and research topics. I definitely learned along the way and as with every other part of my life, I was aided by people who believed in me and gave me opportunities. I have to thank my dear friend Naila for introducing me to styling when I had no clue what I would do next in my life. I believe that I am a designer above all. I can design in many different categories. Scents, accessories, home goods......the sky is truly the limit! You became a mother for the first time at 18 -- how did you find the courage to pursue a freelance creative career? Were you ever tempted to pursue a "safe" or more conventional career? Well, I worked different sales jobs when I first started college. I had just had my son and I knew I needed some kind of money to sustain us so I first worked at the Super Runners Shop. Not long after I was able to get my first corporate job assisting the sales executive for a swimwear company down in the garment district. I made decent money and liked it at first. After about six months I became disenchanted and bored, as well as feeling overwhelmingly stagnated. After that job, I took on a series of other corporate jobs in the apparel industry and with each one felt the same uneasiness after about 6 months. Having these experiences taught me that I did not want to be in an office setting 9-5 for the rest of my life. Of course, it was not easy. It was scary and confusing as to what I would do, but I met some amazing people along the way that encouraged me and showed me that I could carve a path for myself outside of what I knew. You have a strong cultural connection to your Dominican heritage. You grew up in Washington Heights, which is geographically removed from the downtown NYC scene. In what ways has your upbringing in the neighborhood influenced your style and work? Being Dominican has certainly helped me. We are people who appreciate beauty and color and I certainly strive to extend that to everything I do. When I was younger I really didn’t appreciate living in Washington Heights, as I grew up during the crack era and our neighborhoods were affected by everything that was going on. I was very lucky that my mother really worked hard to give us a better life, but nevertheless, you can feel when something does not feel right. I appreciate my bright hood much more now especially since downtown NYC is such a bore in many ways. Your grandmother has also had a profound influence on your style. Can you tell us a little more about how she influenced you? Who are some of the artists/creatives that inspire you? My grandmother really was THE person that influenced me the most when it comes to style and a love of beautiful things. She had an eye for interior decor, style, and uniqueness. I’m inspired by artisans of the world, Louise Bourgeois, Yayoi Kusama, Egon Schiele, Kiki Smith, Lorna Simpson, Malick Sidibe, Sheila Hicks, Gabriel Orozco, and a bunch of others. Yes, I am very organized lol it’s the only way I can function. I really don’t operate well with chaos and messiness. Making patterns is part of my self-assigned therapy and maybe that is why it feels more free and open--it is my time to connect with myself. My creative process is not regimented. I just do it when I want and need to. My style has evolved as I've evolved. It’s an organic transition. I am currently exploring lines and repetition. I just follow a feeling and put down what comes from within. Your husband is from Sweden, and you recently spent a few months there with your family. What were your impressions of their culture? Has being immersed in that culture influenced your work and style? To me Swedish culture is very different from my Dominican culture. I try and appreciate the differences as part of enriching my world view in general. I have always appreciated Scandinavian style and the purity of the material like wood as well as the clean forms combined with my love of color that comes from my vibrant culture, I believe it is a good marriage of my favorite things. You’re the mother of a toddler, but also an entrepreneur in a style profession. In what ways, if any did having a second child affect your daily personal style choices? Do you dress or shop differently now that you're the mother of a toddler again? I think in minimal ways such as being better at managing my time which is still a challenge. I still like to dress in bold patterns and colors, but in a bit more functional way. So yes, having a toddler has influenced me in some ways. 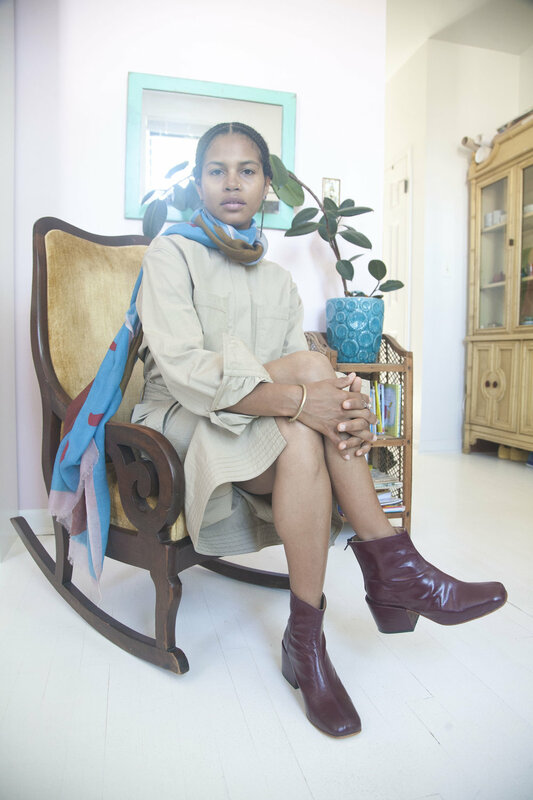 How do you feel as a woman of color in the fashion industry and the arts? How do you find women of color’s work represented in these industries? Is our work represented often or thoughtfully enough? Is there anything you would like to see done differently in that respect? No, of course we have been underrepresented forever and a day. Everyone knows it, but many don’t want to talk about it. Now it’s in everyone’s faces and it can’t be denied. I feel that we have to continue to build our own thing without seeking the approval and or backing of those that do not believe in us. 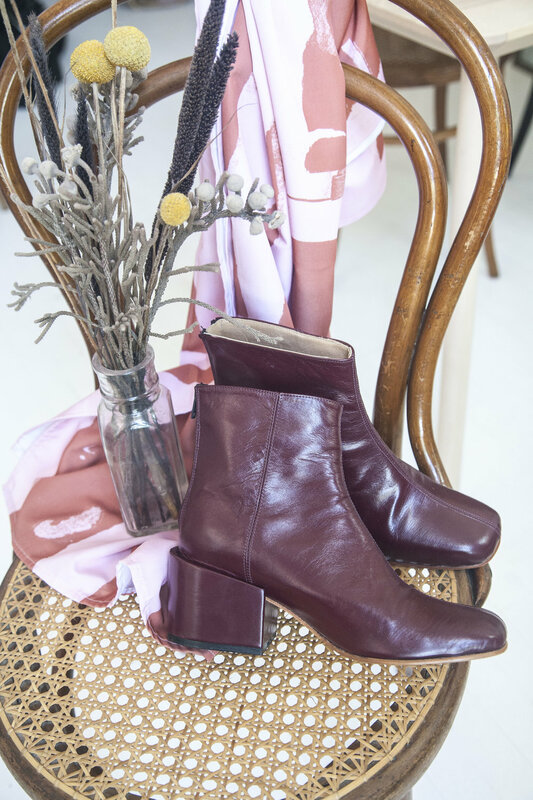 Can you tell me about this look you've styled with the Belu pump? I received the shirt as a gift from the label I Waited For You. I love the color red and I love that it sends a message of women supporting each other. The belt is a piece I've had for many years that I love wearing to be over the top lol. Basic trousers. And my headscarf from my classic collection. The design is from a lithograph I made about 9 years ago. What are some recent or upcoming projects that you’re excited to share? I am working on a project that I have been wanting to execute for some time. 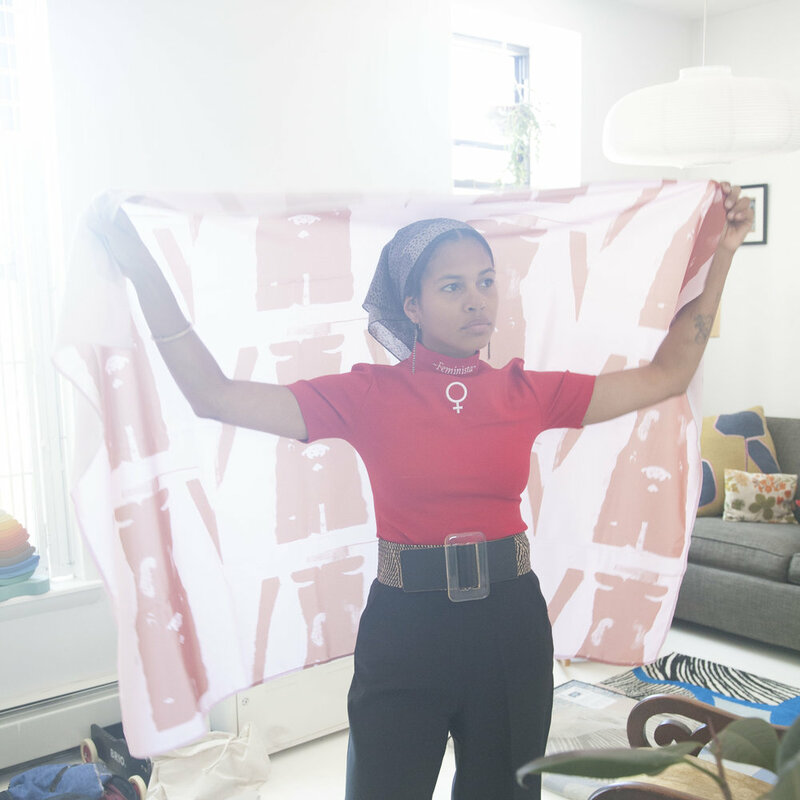 My design assistant Jazzmine and I have designed some limited edition scarves, and a portion of their sale will directly benefit a youth program that works with teenagers that are experiencing hardships. There are also some other projects in the works that I am still keeping low key.